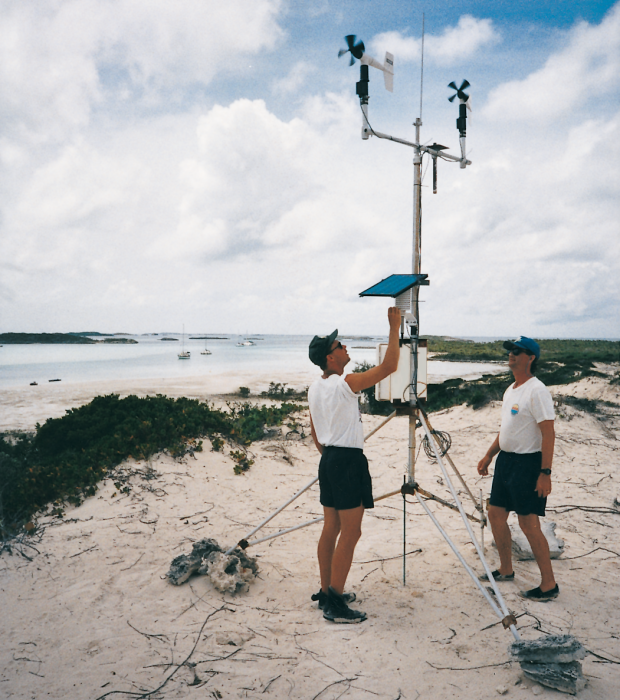 Heinz Proft (left) and Dr. George Dennis inspect a weather station at Warderick Wells Exuma Land and Sea Park, Exuma Cays, Bahamas. The Caribbean Marine Research Center (CMRC) was created in 1984 to address critical problems facing the world’s living marine resources. CMRC is one of the region’s leading centers for field research and training in marine science, with principal facilities in Florida and the Bahamas, research sites throughout the Caribbean, and affiliated scientists and universities. In 1987, CMRC launched a comprehensive, long-term program, entitled Fisheries Oceanography and Recruitment in the Caribbean and Subtropics (FORECAST) to investigate and identify the critical processes that determine changes in the abundance of key marine species in Florida and the Caribbean. In the FORECAST program, scientists from eight U.S. marine science institutions collaborate to examine the meteorology, oceanography, marine ecology, and fisheries biology affecting the life cycles of three commercially important species: the queen conch, spiny lobster, and Nassau grouper. Most marine organisms live and grow in open systems in which ocean currents link mangrove forests, sea grass beds, coral reefs, and open oceans in an interconnected system of marine habitats. The queen conch, spiny lobster and Nassau grouper move among these habitats during their life cycles, hatching in spawning areas and drifting with currents, sometimes for hundreds of miles, before settling onto the sea bottom and growing into adults. Because larval transport is strongly influenced by storms, wind, and currents, a major focus of FORECAST has been to learn how oceanographic and atmospheric forces control the movement of larvae to coastal nursery areas and determine the supply of conch, lobster, and grouper to a given habitat. Several Campbell Scientific, CR10- based weather stations were deployed to monitor the atmospheric forces in Exuma Sound, Bahamas, a major study site in the FORECAST program. The capability to place weather stations in remote locations for extended periods of time is an asset to the program. Weather stations on Cat Island and Eleuthera collected data for up to five months before being downloaded. Results from the weather stations—in conjunction with the net tows, currentmeter data, and field samples—show that successful transport from spawning areas to nursery grounds depends not only on favorable weather conditions, but also on the chance occurrence that larvae will settle safely into nursery grounds. Greater understanding of these factors as well as population dynamics of marine animals is essential in predicting regional supplies of fish and shellfish. This in turn enables effective policies to be set for preserving marine environments. FORECAST is supported by NOAA’s National Undersea Research Program.